About a year ago I decided to take up running. Not to be running from a serial killer but in an attempt to gain some better looking legs and mental clarity. While I have not gained either, I had really begun to enjoy running. 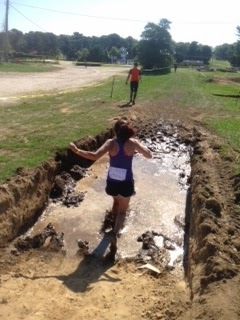 Thanks to Boo’s therapists, I discovered the Obstacle 5Ks. My mother thought I was nuts. Didn’t I remember that I trip on flat pavement? I do fall, often. However the team work and camaraderie at the races are beyond anything you can image. They became addicting. 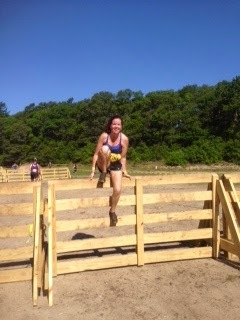 I have since done four obstacle races and have two more this fall. I even got David, my nephew and his girlfriend addicted. Over the weekend we ran the Renegade Playground. After four months on the waiting list, this was the first race I was running for my buddy. There was mud. A lot of mud. For a girl who really doesn’t like to get dirty can I say it was the more fun than you can imagine? 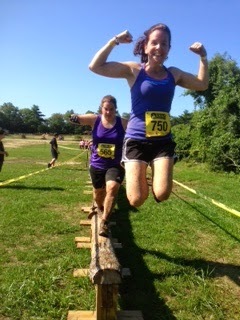 Plus there were balance beams. I survived the entire race without a boo-boo. Not one scratch, bruise or concussion. Our team finished in 53 minutes, leaving no one behind. I even managed to survive the four foot walls. It wasn’t until Sunday that I was in pain. Not from doing the run. From doing dishes. I managed to slice my thumb open. 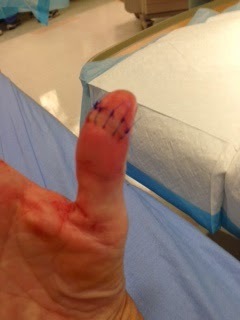 I ended up in the ER getting six stitches. And there was absolutely no wine involved. This is what happens when you recycle. Here I was being a good person, cleaning out the soup can before it went to the recycling. I end up getting stitches. In the ER for three hours with a $90 copay. That equals out to $15 a stitch. Sorry mom, but you were wrong. 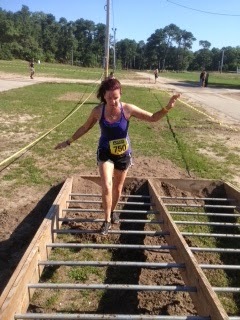 I was perfectly fine and undamaged doing the obstacle races. My next race is Sept 6th. I’m not doing any household chores the week before I want to be healthy for the race. 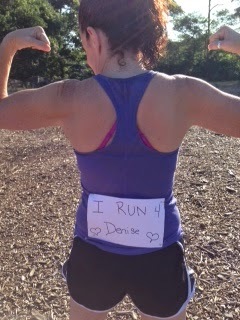 This entry was posted in hospital, run, who I run 4 on August 13, 2014 by firebailey. I was going to write to the much younger us. The one who is upset because our first love left us. Or the one who just met David and thought um….not my type but sure let’s go to dinner. To the younger us who on the eve of her wedding and asked David to elope instead. Or to the new mom to Abby who was scared out of her mind at this thing that wouldn’t stop crying and tell you eventually she would no longer seem breakable. Instead I am writing this for you to receive after Boo’s birth. She is now four months old and you are thinking Holy Crap not only did I just get puked on from my neck to my toes I am getting a letter from the future. You are also thinking I’m writing to give you good news except you know us by now and realize maybe not. First I want to tell you that Boo will survive. You can cry and breathe and rejoice. Now the other shoe dropping on your head is me telling you she will survive but it will not be easy. I am not writing to tell you what will happen. Because no matter what I write it either won’t change things or worse give you the magic answer you are looking form. Rather I write this to the mom of four-month old Boo to give you some advice. Now you know it is really me, right? Never listen to a doctor, a nurse, therapist or school teacher that Boo cannot do something. There will be a doctor or two you will want to punch in the nose, but you will refrain from harming them. Pay no attention to someone who says that Boo is just like their daughter/son/grandchild and “will grow out of it”. Never give up hope. In yourself or in Boo. Do not ever, for one minute, stop searching for an answer. Do not listen to the doctor who says just accept Boo for who she is. It is too important. You and she need the answers and being an unknown neurological syndrome is not an answer. Keep Early Intervention. As awful as it is you will need them when she is three. 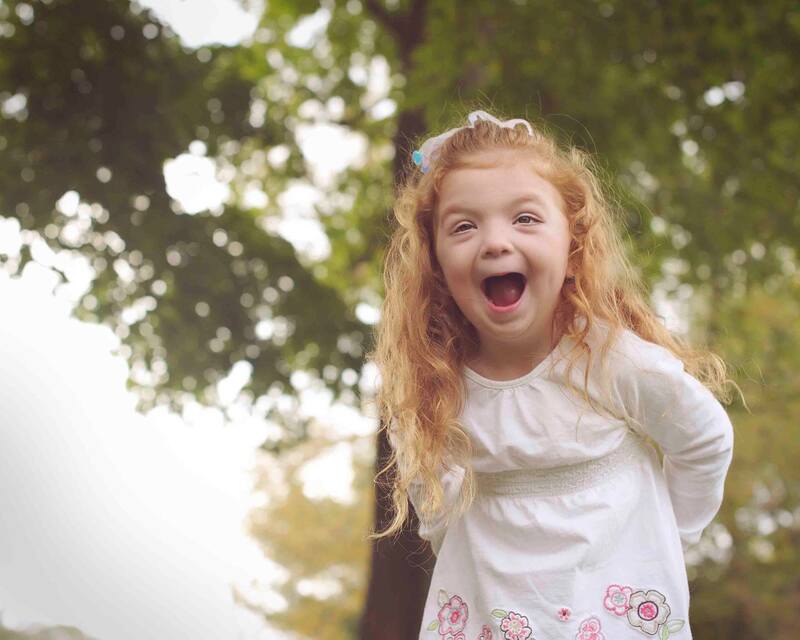 But do not listen to them when they say she does not need Spaulding Center for Children. You are right they are wrong and they will deal with being offended. As much as you have to fight to make Boo all she can be, you will spend more time loving her than fighting for her. She will impact not just your life but those around her. Boo is making a difference in this world one smile at a time. You just have to get through the what seems to be unending puke phase. But I promise it does end. You know all the friends that say “let me know if I can help”? Here’s the thing they WANT to help. You have to TELL them how. Instead of waiting for them to call you, call them. Say I just need someone to come over and sit with me. Call them and say David’s home do you want to go to the canal with me. Call them and say I’m drowning and just need a friend. Cry and laugh with them. You will be amazed at the support just waiting for you. Your future self knows she waited way too long to reach out. Once you do life will become so much easier and less lonely. Remember that David is there and he is your partner in this unexpected life. Don’t wait so long to include him in Boo’s therapies (yes, there is more than one). You will be amazed at how well he does. Lastly, give yourself a break. You are allowed to feel tired and overwhelmed. You are entitled to feel like this just isn’t fair. I promise you that this life becomes easier. You will one day brush your teeth before dinner time. You will one day wear a shirt without Boo’s remains on it. You will be amazed at her journey. I won’t spoil the good parts for you. Be prepared to be amazed. PS–oh and don’t worry you will not cave and buy Abby a pony. This entry was posted in ABA, Abby, alone, awareness, children's hospital, community, developmental delay, occupational therapy, physical therapy, tethered spinal cord, vomit, what's your challenge?, who I run 4 on July 16, 2014 by firebailey. 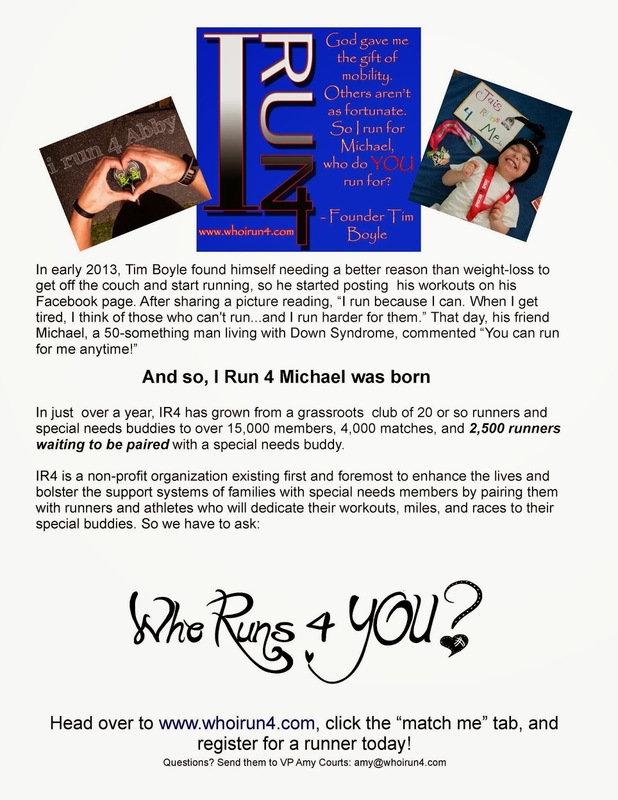 This entry was posted in running, support, who I run 4 on July 11, 2014 by firebailey.